VOCAL COLORS: The Skylark Ensemble recently performed an all a cappella program as a part of the Saint John’s Georgetown Concert Series. As the weather changes and the floral colors of spring come forth, there is something even more special about an afternoon concert. 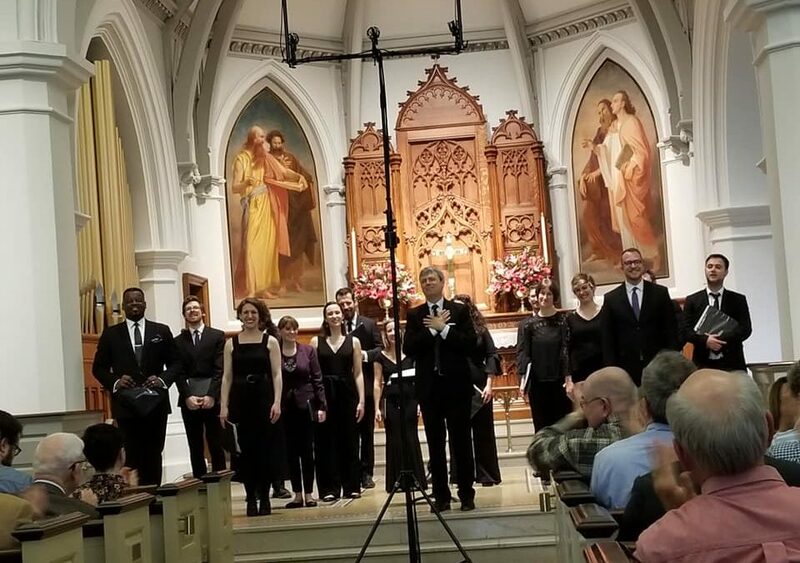 That certainly was true as the touring Skylark Ensemble performed in concert at Saint John’s Georgetown, the last stop of its April 2019 tour. Themed “Masterpiece” the thoughtful program featured compositions by beloved composers who were also watercolor artists. This aspect was used to thread the musical selections together with beautiful artistic renderings. Coupled with the great renderings by composers who were artists such as Felix Mendelssohn to the ones that we readily identify like Monet, Renoir and Picasso. Conducted by Matthew Guard, the voices of the ensemble took the listener on a journey through a myriad of vocal colors and the idea of thoughtful visualization. For some, an all a cappella concert could prove to be challenging in terms of holding one’s attention. This was not the case here as the creative theme of the presentation certainly piqued the interest of the audience. Beginning the program was “Aftonen” by Hugo Alfvén. Sung with a traditional English translation by Norman Luboff, the Swedish gem was a beautifully expansive work that provided the perfect opening ‘test’ for the wonderful acoustics of the church’s sanctuary. Two Mendelssohn works followed sung in German. “Auf Dem See” was a sprightly sung work which also presented a fuller sound from the choir, conveying the opening line “And fresh sustenance, new blood…” In the “Frühlingfeier” the singers showed great control with a sense of wonderful legato in the longer phrases. One must also note the solid foundation provided by the basses, who definitely anchored the ensemble throughout. Selections that represented the French Impressionistic school art were observed in the music of Debussy and Ravel. Debussy’s “Dieu! Qu’il la fait bon regarder!” was beautiful playful and showed the ensemble’s penchant for expressive as well as varied dynamic contrast. Capping this section of music by ‘French’ composers was the profoundly moving setting of the “Tenebrae factae sunt” by Francis Poulenc. Sung with a probing conviction, the darker color that permeated the sanctuary was so appropriate during this time of the liturgical year: Lent. A highlight of the concert was commissioned piece by Nell Shaw Cohen, who was present in the audience. Based on the beautiful wallpaper designs and writings of William Morris, the thoughtful work gave careful consideration to the beautiful flowers or wonders of nature represented in his output. Whether in unison or in combination, the singers reflected the opulent beauty of each spring creation. As the work progressed, the listener was presented with a full bouquet solidified in this work of tremendous thought and contemplation. Ending the program as a setting of Gustav Mahler’s “Ich bin der Welt” arranged for 16 voices by Clytus Gottwald. The talented ensemble boasted numerous solo standouts, but one must mention the angelic, seraphic soprano of Sarah Moyer, who effortlessly projected her voice heavenward. As an encore, the Boston based Skylark offered the movingly beautiful “O Magnum Mysterium” by Morten Lauriden. 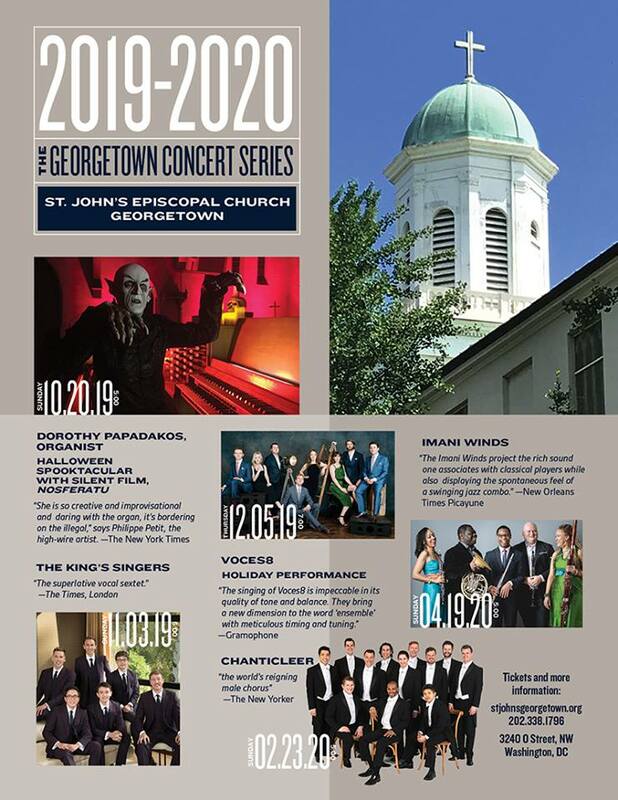 For more information of the Saint John’s Georgetown Concert Series curated by organist/choirmaster Samuel Carabetta, including the 2019-2020 season, please CLICK HERE.